Abstract: The author sets out to provide a comprehensive overview of all source material, previous research and overarching theories with regard to the Nordic god Ullr, known primarily from the Snorra Edda as a god of bows and skiing, and from Swedish and Norwegian place names as an archaic god whose cult was abandoned before the Viking Age. It is demonstrated that there is significant reason to doubt various aspects of the claims made by Snorri Sturluson in regard to the god, and especially those of the relation between Ullr and Sif. Among other things, the evidence given for the theories of Ullr’s relation to Freyr, his status as a sun god, and his association with law and justice is explored. The author investigates furthermore the possibility of Old West Norse Ullinn existing in a contracted genitive form Ulls in a 10th century skaldic kenning, something also implied by the Scandinavian variations of the Icelandic anatomical term ullinseyru, and other factors. It is also postulated that a variety of factors suggest, that the extant evidence from various sources in regard to Ullr reflects two stages of the god’s role in religious worship, and that future research must focus on settling the problematic relation between Snorri’s account of the god, and the indications presented in place names. Introduction: In the Old Icelandic and Norwegian literary sources, Ullr is one of the least frequently occurring gods. Snorri Sturluson knew only little of this elusive deity, and describes the god only briefly in his Gylfaginning and Skáldskaparmál. Snorri recounts no myth in support of his claims about the god, and one might consequently assume that large parts of Snorri’s information were deduced from the numerous skaldic kennings involving the name of the god, rather than any additional source. Danish historian Saxo Grammaticus says less about the characteristics of the god, but recounts a myth involving the figure Ollerus, who is undoubtedly based on the Old West Norse and Old Icelandic Ullr. Saxo’s story remains the only surviving account of a myth involving Ullr, however, and its implications for our understanding of the god are unique. 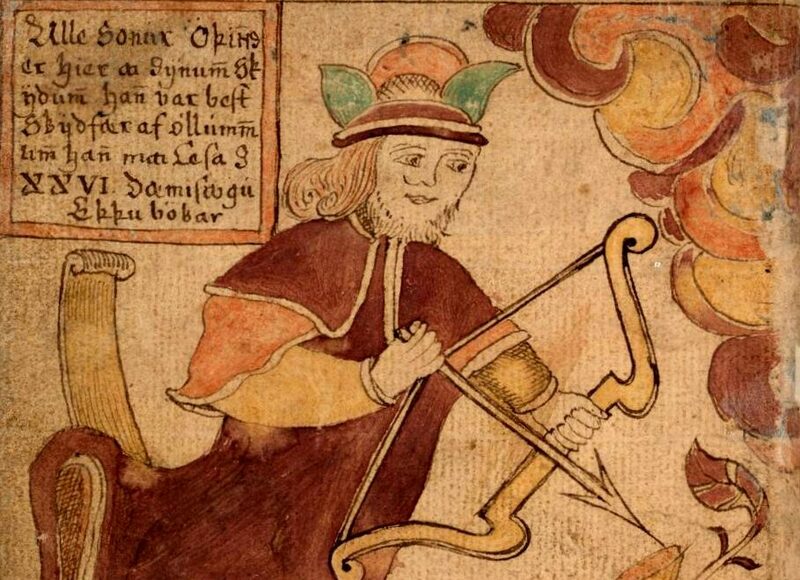 Top Image: Illustration from an 18th-century Icelandic manuscript shows Ullr on his skis and with his bow.